Brewing coffee in a French Press is often seen as time consuming and not doable in the rush that most weekday mornings bring. 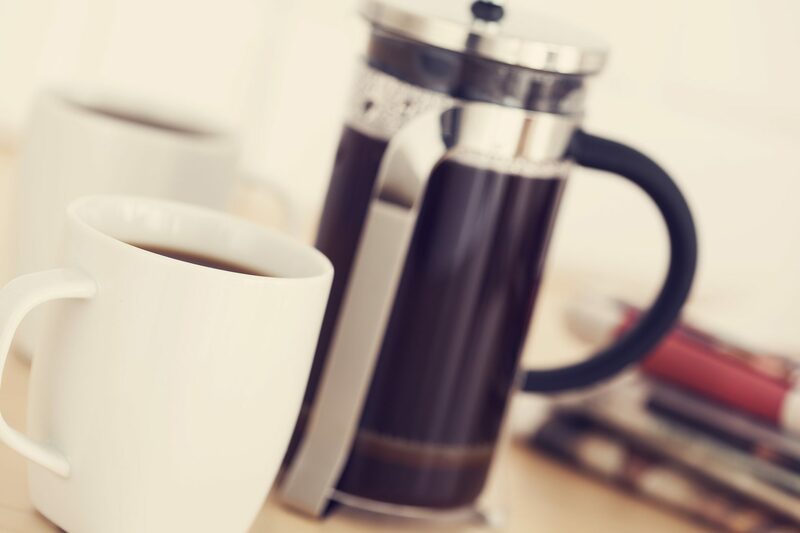 But with 3 easy steps, and even some great tools like this French Press travel mug, we think that taking a few extra minutes is worth the reward – an amazing cup of coffee to start your day off right! Things Get Heated: Pre-heat or warm your French Press. Setting it aside while you grind the beans is idea, but even a quick swirl of hot water goes along way to keeping your coffee pipping hot. Back to the Grind: Course grind the beans (to about the same size as course salt). For an 8 cup French Press, you’ll need about 55g of ground coffee, or about 8 rounded tablespoons. It’s Brew Time: Empty the water from the preheat, add the coffee grounds and fill the French Press back up with hot water (around 200 degrees Fahrenheit). Put the lid on securely and wait about 4 minutes. Then slowly press down the plunger. Pour into your warmed coffee mug and enjoy!